Boosting your current customer experience in a form of an ad can be a great campaign to gain new customers. And what’s the best way to reach broader but targeted audience? Of course, Facebook Ads. Let me introduce you to the EmbedSocial’s latest feature, Facebook Ads. We are allowing all users of the EmbedReviews platform to use their pre-generated reviews and launch a Facebook campaign. 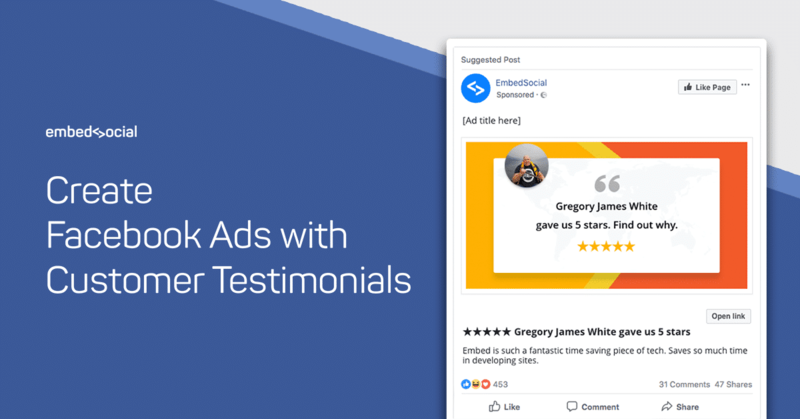 In simple words, you will be able to select customer testimonial that you’ve generated from your Facebook page, Google location or Yelp listing and use this testimonial in a Facebook Ad, by clicking 2-3 buttons. Just imagine how powerful and easy is to run a campaign with the content you already have from your most satisfied customers. Let your happy customers do the talking and make an impact on your ads conversion rates. Providing social proof and REAL testimonials from satisfied customers, is one of the most effective ways to accelerate the decision-making process for your new and potential customers. How to create my first Facebook Ad with a Customer Testimonial? The system works with already established Facebook Ad accounts, so you will only need to choose which review to display in your ad. The EmbedSocial Ads Manager is a one-page step, where you will need to select the review, ad budget, write Ad text and publish your ad. 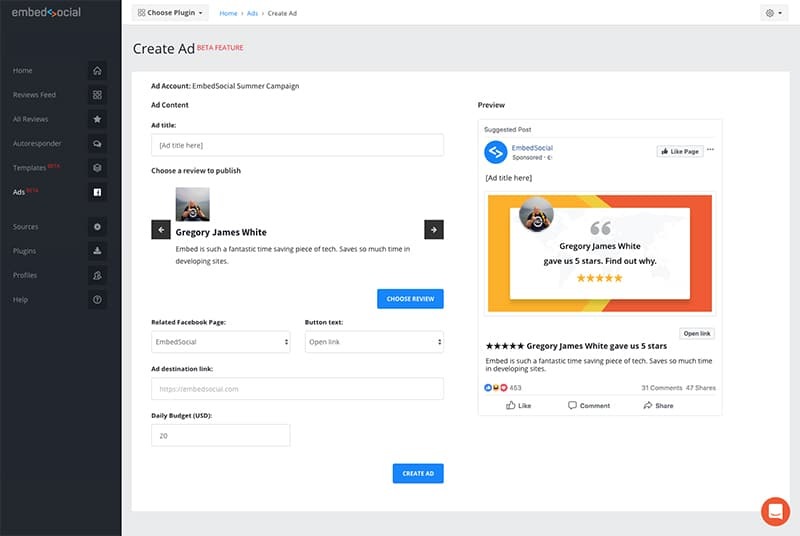 All ads that you will create in EmbedSocial, can be also accessed through your Facebook Ads Manager where you can pause or reuse the ad for different campaigns. Please note, that the payment is processed through your Facebook Ad accounts, which means that our system takes 0 (zero) commission for each of the ads you’ve created. To start with Facebook ads, just log in to your EmbedReviews account, click on ADs and follow the setup steps. Thanks to our in-depth integration with the Facebook platform, we can provide you with the Facebook Ads feature that you can use to reach more customers and drive traffic to your website. 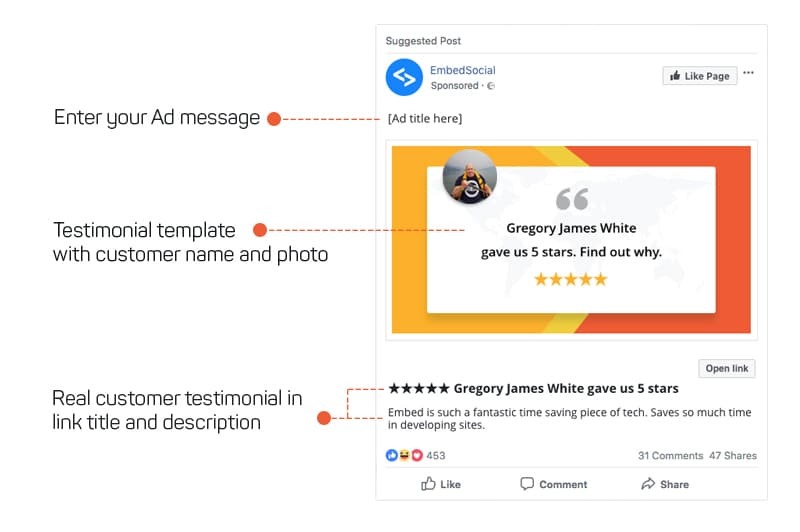 Our Ads tool will set the targeting for the audience that will most likely engage with your ad, so you will not need to define any targeting settings. So, if you are not a PRO Facebook advertiser or just need a simple tool to push Facebook Ads, this feature will be perfect for you. If you still do not have an EmbedReviews account start a free trial now, and see how it works or schedule a demo and our team will provide you with a detailed tour.